A raw footage compilation of the new ARM Sanctuary that ARM is creating to provide life long after care to the animals of abuse which are rescued, following the investigations and rescues. ARM's Founder with Freedoms Flight who he rescued following an illegal animal slaughter farm rescue. This horse, and the discovery of the Black Market Horse Meat trade in Miami, became the reason for creating Animal Recovery Mission (ARM). Freedoms Flight was tied to a tree at the time of his rescue, riddled with strangled and a severe leg injury as a racehorse. He was destined to be slaughtered for his meat by one of Miami's most reknown horse killers - Manuel Coto. Freedoms Flight now lives his life at the ARM Sanctuary. The heartbreaking condition of many of the animals that are filtered through the hundreds of illegal slaughter farms in Florida alone. ARM, since its inception, has now investigated, exposed and closed down over 135 of these operations. Rescuing these animals and derailing this type of criminal activity in our community has made a great impact. This Goat kid, Eve, was born following one of ARM's investigations and raids of an illegal animal slaughter and sacrifice farm. 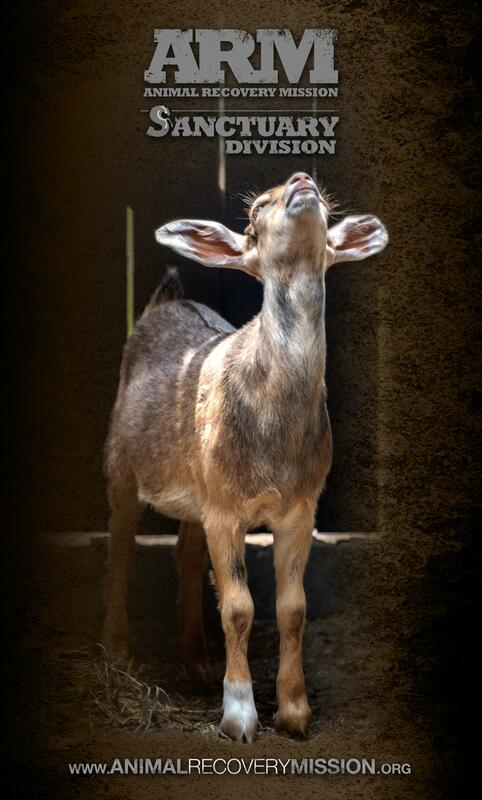 She would have been brutally slaughtered, now she is one of ARM's mascots for the Sanctuary Division. Following ARMs grueling undercover investigations, the most satisfying moments for the investigators and organization, is seeing the violent animal killers in handcuffs and seizing all of the animals on their property that would otherwise have been slaughtered in an inhumane manner. These rescues ultimately save the countless animals that would have also met the same fate, had the operations continued prior to ARMs intervention. ARM was the first animal defense organization to expose and shine the light on the most grossly misunderstood & disturbing animal cruelty industry known as the black market horse meat trade (Click here to learn more https://bit.ly/2CkRx5w). Criminal offenders and organized crime rings of this underground market, prey one horses who are either procured from the backs of racetracks due to injury or lack of the ‘winning streak’, from craigslist ads and animal auctions and are also taken from the safety of their homes as peoples beloved pets and family members. They are butchered inhumanely, all while still alive, and stripped of their meat and sold for human consumption. Considered amongst many cultures, horse meat is considered to be a delicacy as well as a medicinal cure for ailments ranging from blood thinning disorders, cancer and even for sexual enhancement cures. The discovery of this industry became the reasoning for ARM’s Founder, Richard Couto, to create an organization dedicated to exposing and ending this gruesome industry. With extensive horse slaughter investigations under it’s belt, ARM aided in the passage of law in 2010 making it a third degree felony if a person is even found with a piece of horse meat on their forks. This crime includes killing, selling or storing horse meat. Countless convictions have succeeded with this legislature and several offenders are currently serving prison sentences for their violent crimes, as a result of ARM’s investigations. A large part of ARMs work, which also connects to the illegal animal slaughter farm industries in Miami, is addressing the inhumane handling, processing and selling of animals used in religious ceremonies. The animals are mistreated, deprived of food and water and are bound by duct tape or rope. Almost always they are locked in unventilated car trunks and left bound, sometimes for days, before they are sacrificed for ceremonies. ARM stands to address the standards in which animals are treated in every arena. ARM strives to provide lifelong care for the animals rescued following its undercover investigations of animal cruelty operations. An urgent need to execute this wish, is to construct a large barn and quarantine facility upon its private animal sanctuary. Whilst it has made vast improvements from fencing to animal structures, funding for a permanent and safe barn is still being raised. This program will be geared towards building a 20 stall barn equipped with a quarantine section to safety house sick or injured animals. ARM is also initiating a capital campaign to address many of these expenses and hopes to be able to offer naming rights to major donors and contributors. Also important to ARM is the raising of awareness of crimes against animals and what ARM is doing to derail them. ARM has drastically enhanced it's outreach and public engagement programs, educational events and public speaking opportunities in its efforts to promote a more conscious lifestyle.